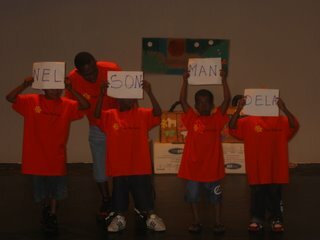 This weekned I was with the families of Camp De Fambul - a one-of a kind camp for refugee children from Africa. My soul-sister Tami, who thought up this utopia 6 years ago with another female genius & Nah We Yone, invited me to join her this weekend. This amazing not for profit organization enrolled 52 African children (ages 4-19 yr. olds) to attend a weekend of Camp De Fambul (located in beautiful West Chester County at Manhattanville College.) The families come from all over the NY area and camp is the high-lite of their year. BTW, Nah We Yone means It belongs to us. Some of the activities that I was honored to partake in with the kids were swimming, African dancing (MY FAVORITE! ), traditional craft making (weaving), talent exploration (African songs, dancing - homage to the continent), disco dancing, delicious food gatherings and inspiring presenters with open sharing discussions. So much inspired me this weekend!! In particular, the staff - were truly amazing; and all volunteers. Everyone was loving, giving, creative and fun! I also fell in love with the way the children united with each other. In only 2 nights & 3 days the kids unite as one! The older kids looked out for the lil ones, the counslers cared for all, hugs, smiles and a whole lotta love! I particularly connected with a 8 yr. old girl named Mbollu. We had previously danced together at the Refugee All Star band - and others from Nah We Yone...we gave each other a big hug when we saw each other. And reminisced about that summer night when she fell asleep on my lap & I protected her from the rain with a piece of paper. Anyway, she made me a beautiful card in camp & told me I was like her mother. I could go on, but my hands are hurting from typing - please do mkae a donation & be the difference! !